After hundreds of iterations, prototypes, phases of market testing, and a successful Kickstarter campaign that crowdsourced more than $100,000 in startup capital, Spor chargers are nearing distribution. David Hunt ‘14 and Jason Browne ‘14 are currently in China overseeing the production of the first batch of Spors — solar-power harnessing chargers that power devices such as phones and tablets. They founded Spor Chargers last year while completing their undergraduate degrees in finance at Drexel LeBow. “Our product is simple, it is highly durable and adaptable under environmental situations, and gives life to products and even to other Spors through daisy chaining” (the ability to charge one Spor charger with another), says Hunt. 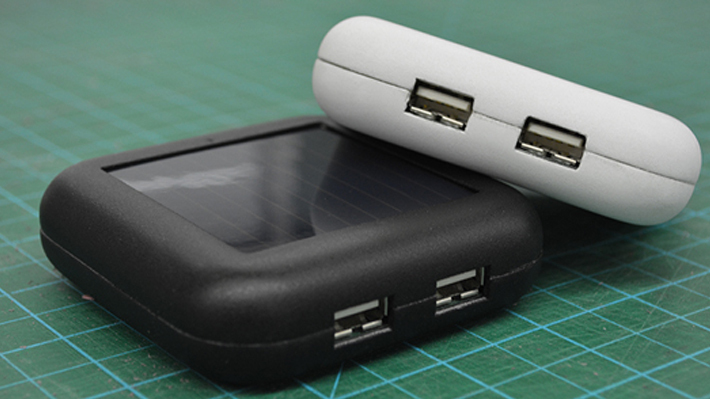 Spor chargers — some of which feature customizable shells made using a 3D printer — do more than give mobile devices power. They make clean energy more accessible and affordable for the world. Spor chargers aren’t just solar chargeable; they can also be powered through indoor lighting as well as by connecting to USB ports and electrical outlets. Browne, who had the original idea for Spor, is more forceful in his messaging. Editor’s Note: Though the company’s Kickstarter campaign has ended, you can still order a Spor through the company’s website. David Hunt ‘14 addressed graduating students and their families at commencement on June 14 with a message about focusing on our similarities instead of our differences. “Let’s all just be a little more like water and retain core values, but adapt our perceptions to that which yields the related value for our collective existence,” he says.